← Pros and Cons Of Making Your own UVA and UVB Sunblock with Zinc Oxide! Do you want to get rid of cellulite using essential oils? Many are affected by this condition. Some are overweight, some are underweight – it can equally affect thing and not so thin men and more women, and there are known cases of cellulites in patients with anorexia. 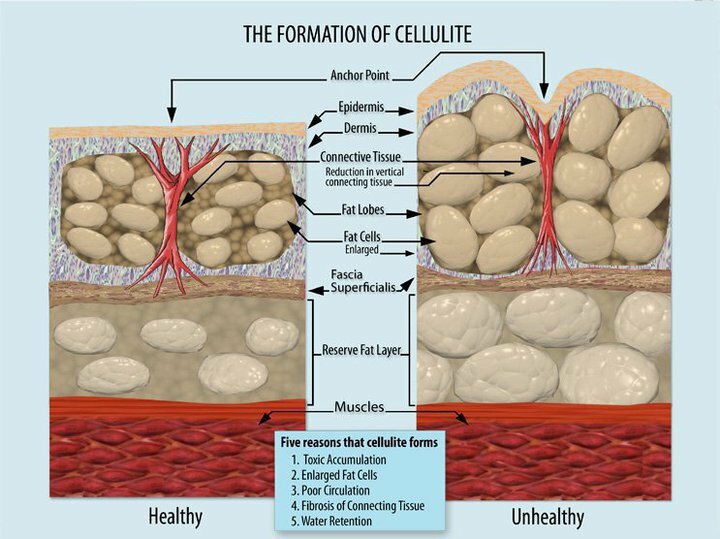 Cellulite most affects women and it has definitely to do with the hormonal balance. Common areas for cellulite are upper things, buttocks and hips. Luckily aromatherapy massage can do wonders for fighting cellulite, however, it goes hand in hand with the healthy diets, lots of water and exercise. Aromatherapy is one of the most successful forms of treatment for this condition. It is not only a cosmetic problem, as one might see it, but it is a sign that the body is in the state of toxic state, it shows that the lymphatic system is sluggish and elimination is not so efficient. To help in this case essential oils with the detoxifying stimulating, balancing and diuretic properties are need to be utilized in the form of body oils, massage, packs. Essential oils, such as rosemary, geranium, juniper, black pepper and grapefruit should be used. These oils can be used in the lymphatic massage for reducing swelling and encouraging a more efficient drainage of lymph. If you can not use Rosemary, then use Black Pepper instead (if you are prone to seizures, epilepsy or have HBP, then rosemary is not for you.) Also it should be used between the massage treatments at home on daily basis, massaging it in with the brush or massage glove. Recipe: 1 oz of carrier oils, grapeseed. Add 4dr rosemary, 4 dr geranium, 2 dr juniper, 2 dr grapefruit. Or Recipe: 5dr geranium, 3 dr juniper, 2 dr pepper, 2dr fennel. The benefits of the massage and self-application at home can be enhanced by bathing with a selection of the same oils and by gently brushing the affected areas whilst in the bath. Essential oils for the bath are rosemary, juniper, geranium and fennel. Do not exceed total of 8 to 10 dr in the bath water. Bathing for no longer than 20 min. During this treatment a strict and healthy diet loaded with raw veggies and fruits and lots of spring water is a must. Above treatments can also help with the water retention during PMS. WARNING: Lymphatic massage can not be done for patients with cancer. Lymphatic system is a route by which malignant cells can move from one part of the body to the other and give rise to secondary cancers. This massage is not for pregnant women.